A mix of stone and wood materials gives this cocktail table a polished and fresh appearance. 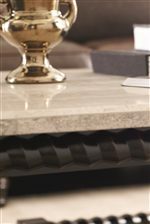 The laminated Travertine stone top suggests modern luxury, while the rope twist motif and bun feet create a striking silhouette that references traditional design. An ebonized finish on the wood base completes the look for a piece that is the essence of classic sophistication. 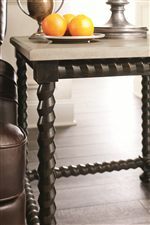 The Alcott Ave Cocktail Table with Travertine Stone Top by Bernhardt at Morris Home in the Dayton, Cincinnati, Columbus, Ohio, Northern Kentucky area. Product availability may vary. Contact us for the most current availability on this product. Finish & Paint Options Ebonized finish on wood bases. Case Detail Rope twist motif on wood bases. Bun feet. 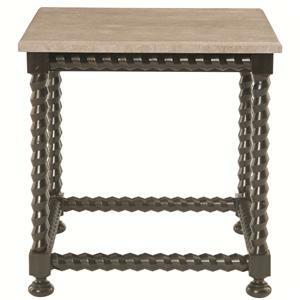 Bring a polished look to your home with the Cordova collection of occasional tables. The cocktail and end table feature laminated Travertine stone tops supported by wood bases in an Ebonized finish. 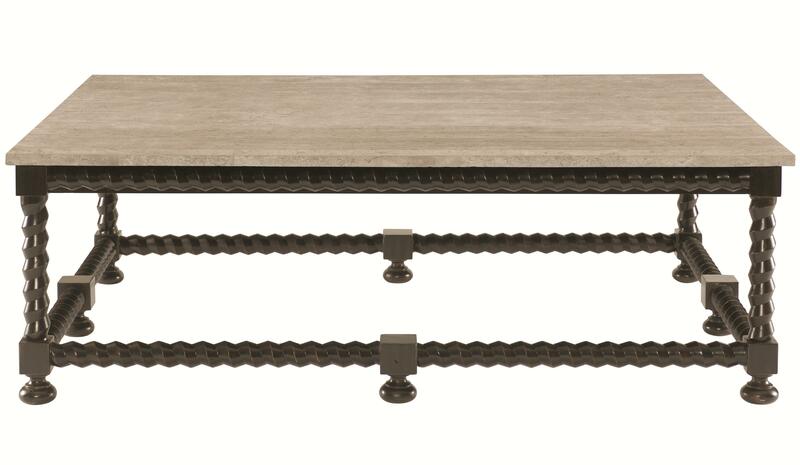 A rope twist motif on the table bases creates graceful movement, balanced by the classic look of the stone top. With a versatile look that's equally suited for a more modern or a traditionally styled home, Cordova adds instant sophistication to any living space. The Alcott Ave collection is a great option if you are looking for Transitional furniture in the Dayton, Cincinnati, Columbus, Ohio, Northern Kentucky area. Browse other items in the Alcott Ave collection from Morris Home in the Dayton, Cincinnati, Columbus, Ohio, Northern Kentucky area.